From Williamsburg, Virginia, Governor Robert Dinwiddie addresses the House of Burgesses to address the continuing problem of French and Indian incursions into Virginia’s western territories and calling them to action. [BENJAMIN FRANKLIN]. Newspaper. Pennsylvania Gazette, Philadelphia, Pa., November 7, 1754. 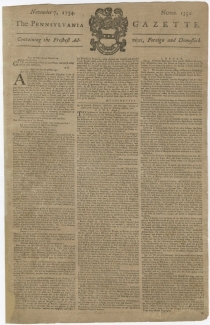 4 pp., 9¼ x 14½ in. 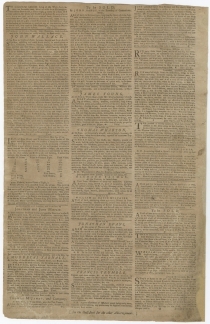 “Yesterday [October 17, 1754] the General Assembly of the Colony met at the Capitol, in this City [Williamsburg] when his Honour the Governor opened the Session with the following Speech. After Virginia Governor Robert Dinwiddie sent a young George Washington on his ill-fated mission to block the French in the Ohio Valley, he asks the Virginia legislature to grant him the resources to counter further French incursions. The French and Indian War would ultimately last nine years and result in the defeat of the French in continental North America. Very good. Toned. Margins tight but no loss to text. Some professionally-repaired tears.